Highlight : One of the famous diving destinations in Goa. One among the South Goa's quietest beaches, Bogmalo Beach is a part of Bardez district which belongs to both the North and South beach circuit. Located 4 kms away from the Goa Airport at Dabolim, Bogmalo was a fishing village before tourism developed. 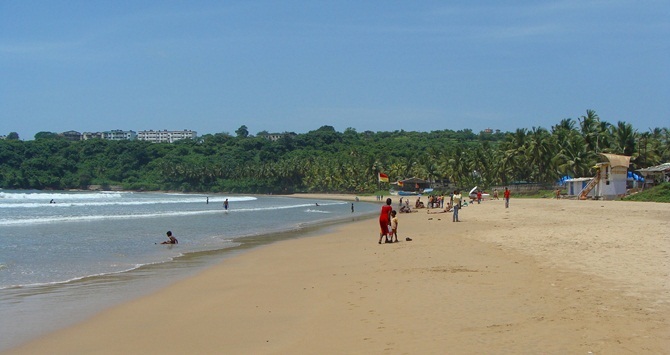 Compared to the other beaches in Goa, Bogmalo beach is cleaner and more relaxed. Bogmalo is great opotion if any want a prime view of the Arabian Sea. Surrounded by hills on three sides, it's golden sand, swaying coconut palms, calmness and big surf attracts a variety of tourists especially Honeymooner's. In Bogmalo, there is a small diving school (09822100380, 2538204) where one can learn Scuba Diving from a PADI (Professional Association of Diving Instructors) approved Diving School. It's office is based in Joet's guesthouse situated far end of the beach. It is a British run outfit which also offers half day 'Try Dives' for novices, guided dives to shipwreck sites and coral beds off the coast. Advance qualification courses are also offered. (Address: Goa Diving, House No. 145P, Chapel Bhat, Chicalim, Near Bogmalo). The beach also has been the venue for Sandpiper Enterprise World sailing championships. Near the Bogmalo beach is the must visit tourist place, the Naval Aviation Museum. Set up in 1998, it is the first naval museum in Asia. Here one can find aircrafts, sensors, safety equipment and weapons that were used by the Indian Navy. The museum also boasts weapons and armaments gallery that showcases a number of different types of torpedoes, bombs, cannons and sensors that have been used by the aircrafts. Bogmalo is a sandy cove with several beach shacks which provides various food and drinks. The beach is safe and perfect for swimming. Even though swimming is safe in Bogmalo, one must be careful when swimming and check out with the lifeguards for the strength of the undercurrents. Sunbathing is another popular activity on Bogmalo beach. Apart from these usual beach activities, Bogmalo beach offers an opportunity to enjoy water sports such as wind surfing, water skiing and diving. Boating facilities are also available here. The Sunset view is amazing from the beach. The sandy beach at the end of the cove is the most picture perfect spot at Bogmalo. For tourists there are many shops and malls near Bogmalo Beach, which sells little trinkets, clothes and handicraft items. The famous luxurious Oberoi hotel is situated on this beach and they caters to the leisurely needs of its visitors.